The game format is sometimes generalized even further by allowing more than two players on each side. In formal Pair Go, each player plays in turn without consultation. For informal pair go, anything the players agree on, including discussion before or after a move may occur. Two teams play, each a male/female pair. For handicap games, a team's grade is the mean of the individual players. Normal rotation is Black lady, White lady, Black man, White man, etc. In handicap games, the Black lady's first move is the placing of the handicap stones. You played out of sequence. If an out of sequence play is noticed before the next play and it was intentional, the game is forfeit by the player. If unintentional then a 3 prisoner penalty is handed over and normal rotation continues from the player under discussion. No moves are undone. A rotation error can only be claimed when the move just played was out of the rotation sequence. If the error was unintentional, the players are fined 3 points, if it was intentional they forfeit the game. Pair Go has become an arena for tournaments, both local and international. See for example, http://www.pairgo.or.jp/. Rengo can be played with players of different strengths, the strength of the team is usually taken to be the average of the strength of the players. It is common to add the 'kyu values' (dans counting as negative), then divide by two. Difference in strength between the teams can be compensated for by handicap as usual. As average strengths may include half ranks, this is sometimes compensated for additionally with komi. 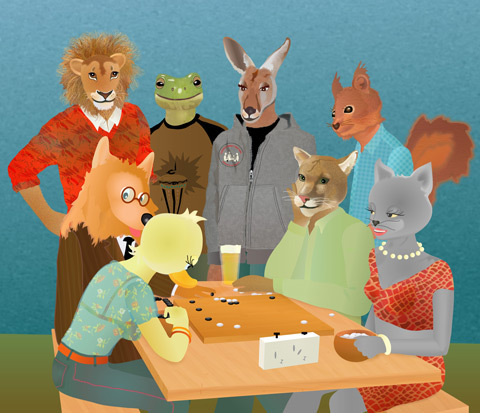 Discussion on moves before they are played is not allowed, but direct kibitz (or slaughtering) of moves just after they are played is often used in rengo - especially as long as it is done in a constructive way. Rengos can be a good way for low-level kyus to learn from stronger players, but stronger players will often pull their hairs out as they try to correct blunders made by their partners. Several Go Servers support rengo matches. assuming players are from the same group/club/family/etc (and there is no particular reason to form long-time teams), how should players with varying strenghts be paired, how should teams be set up? how are players seated; can seating make a difference? according to the page above, women are positioned first. courtesy rule? weak players first? how are komi and handicaps decided? how is the clock managed? On KGS, each player has his/her own clock. Avoid unmannerly speech, conduct, attitudes, or dress.